Today, I thought I'd share with you our bathroom. I should warn you, it isn't pretty! Obviously its functional and meets our needs but it certainly isn't pretty. The people who lived here before us had questionable taste and seemed to be very fond of tiles. As you can see, it is completely tiled from floor to ceiling - as is the en suite and downstairs toilet (and kitchen!). 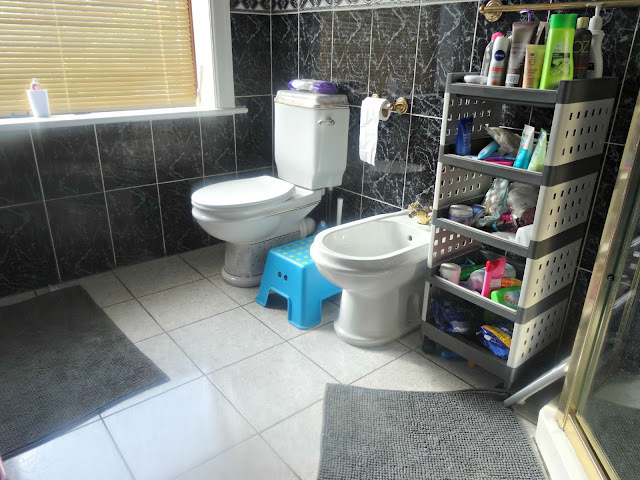 I can understand why someone would want to tile a bathroom - it makes it easy to clean - but the tiles on the wall are completely mismatched with those on the floor. The dark grouting on the floor tiles makes them look grubby and the wall tiles are, frankly, hideous. Its a very dark and dull room. We don't have a bath which is interesting when it comes to bathing the girls. Luckily we still have our Stokke Flexi Bath, which just fits in the bottom of the shower although bath time takes a lot longer and I'm trying to get the girls used to the shower! As there's no storage, I'm using this trolley which is fine but everything is on show and it looks cluttered (not to mention everything getting covered in dust). The bidet, as far as I am concerned, is a waste of space. 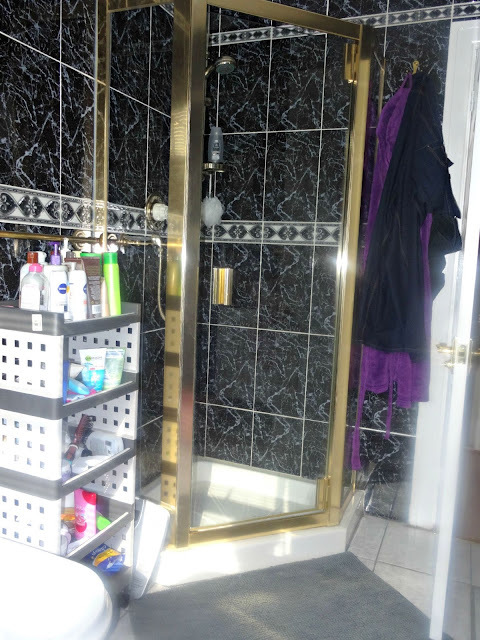 As well as the grim tiles, there's a lot of gold. 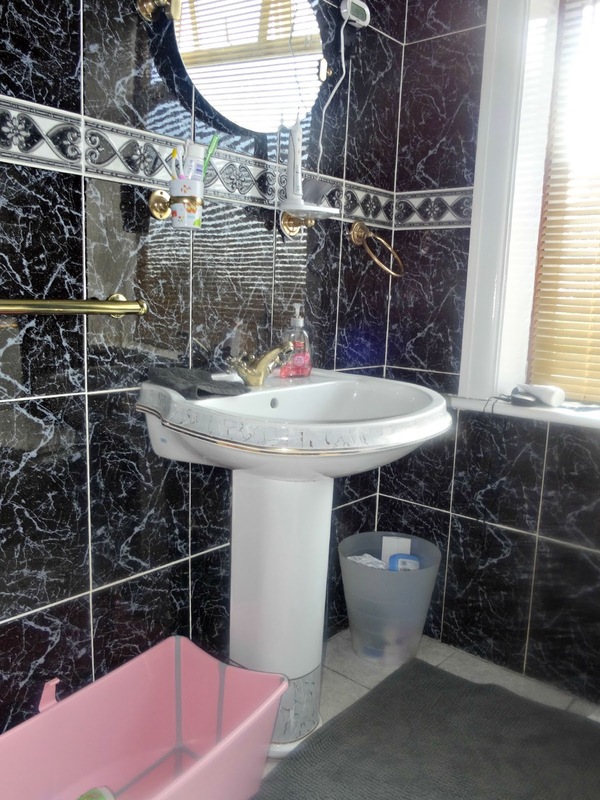 Note the gold trim on the sink which has faded in places. The fittings are all gold too - we have two towels rails and a towel ring. All of the fittings, despite trying to fasten them, are loose. Of course, we knew all of this when we brought the house and its all part of the doing it up process and putting our mark on it. That being said, I can't wait until we can get the bathroom done. At the moment of writing, I don't have a set idea as to how I would like the bathroom to look. The rest of the house is neutral with lots of natural bright light coming through so in keeping with that, the the first thing I would do is remove the dark and dated wall tiles. I'm torn between a pop of colour via a tiled splash back in these Metro and neutral tiles, adding colour with accessories. I love these metro wall tiles either in teal or grey and think they would work well in the space. I also like these grey Muralla brick tiles which look like they would add some texture and a modern feel to the room. 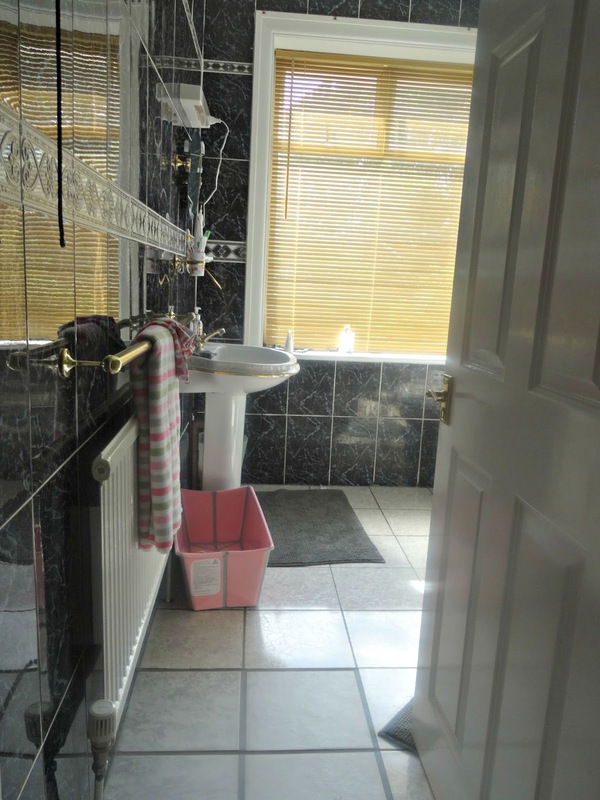 The bathroom suite would be white, avoiding anything patterned so that it wouldn't look dated and the bidet would be removed as that's just wasted space. The Hudson Reed Granger suite is catching my eye with a large sink so I could pop our toothbrushes etc on (rather than the gold, wobbly fixtures!) and is very modern looking. The Ultra Lux Bathroom suite is also calling to me with the vanity unit underneath the sink being perfect to hide all my lotions and potions! This post is my entry for the Dream Bathroom competition being run by Big Bathroom Shop and Tile Mountain who ask "..... is your bathroom a bit tired and in need of some love? Frustrated by its outdated tiles or dreaming of a new suite?..." I think we can clearly see that the answer to that is a big fat YES. Pop on over to my Pinterest page to see the board I have created with my favourite tiles and bathroom suites (unfortunately I couldn't get the widget to insert so follow the link underneath to reach my board and view my selection in full). 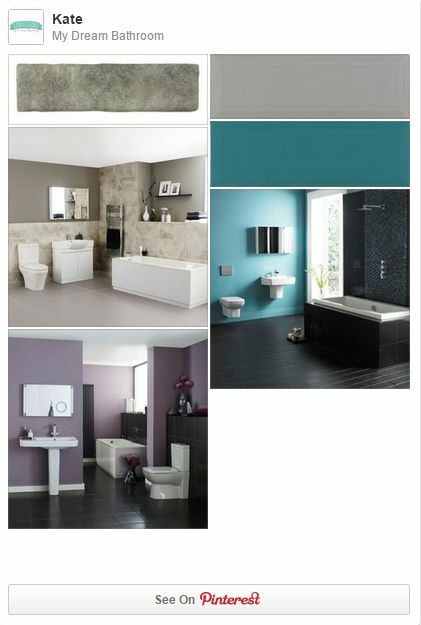 Follow Kate's board My Dream Bathroom on Pinterest.